There are places on earth that just have the perfect combination of geographical features and habitat that make them exponentially more birdy than other places and we appropriately call them "Hotspots". Many of them, like Magee Marsh, OH, High Island, TX, and Fort Jefferson on the Dry Tortugas are legendary hotspots during migration. A birder's local patch may not have the volume and intensity of those internationally known hotspots, but over time we come to know our birding haunts intimately and appreciate the subtleties of bird patterns and movement within them. Within my own lunch-hour birding patch (and within all my former patches) I have come to discover that there are certain locations that are much more consistently birdy than others...micro-hotspots if you will. 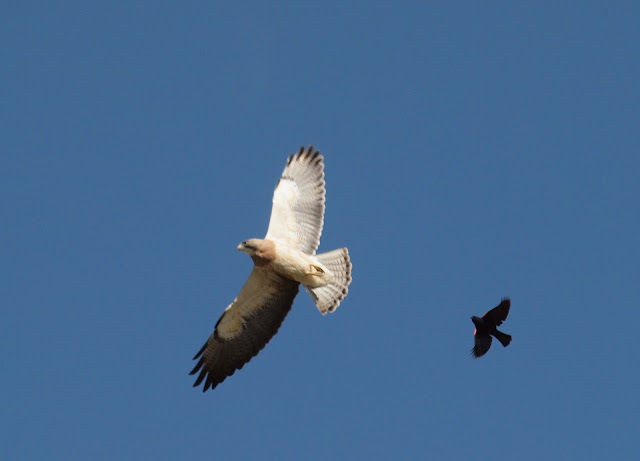 Even though the terrain and habitat appear to be equal, some spots simply have more birds than others. Recently, I've been pondering "Why?" My conclusion is that there naturally exist "bird funnels" - places where birds coming from wide and far are narrowed into a concentrated smaller area for we birders to enjoy. A bird funnel, especially on the micro level may be different than a known fly-way or even than an island of habitat in which birds abound. These bird funnels may occur for a variety of reasons and the theory I think applies to both the mega-world-hotspots as well as the micro-hotspots within our local patches. Allow me to use my lunch-hour birding patch as an example. Below are satellite images of both the north and south portions of my patch. I have indicated the consistently birdiest sections in orange. The yellow lines show the perceived funneling that I am talking about. At the tip of each funnel is where I see the most birds on a regular basis, no matter the season. My Lunch-hour birding patch - north of 4000 S.
The larger funnel is created by a ridge that runs along its eastern side below those apartment buildings. The wide end of the funnel where some orange micro-hotspots are indicated is a natural landing pad as birds following the Jordan River cross the road and then typically funnel into the point. 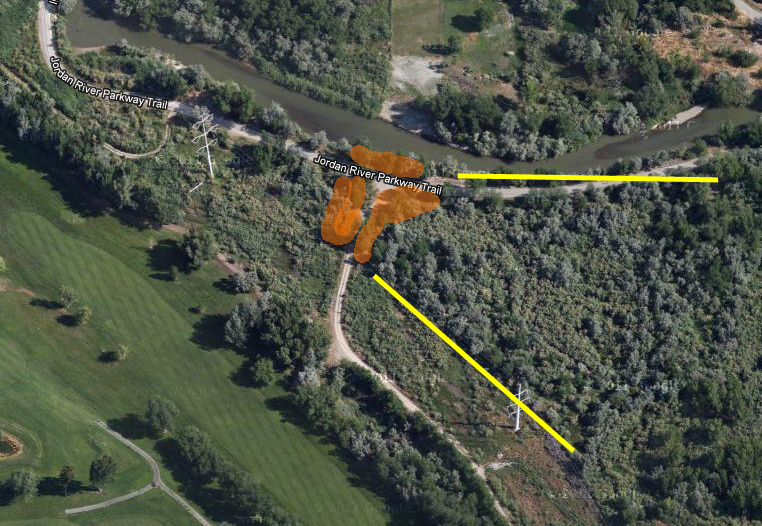 At the point, are three russian olive trees not immediately connected to the larger chain of cottonwood trees. It always amazes me how many different species I have found, sometimes at the same time, in those three little trees. The smaller funnel shown on the top of the satellite image may in reality be an extension of the larger funnel, rather than its own little funnel. It is sort of a hopping off place as birds decide whether to forage here a bit more or cross the river. 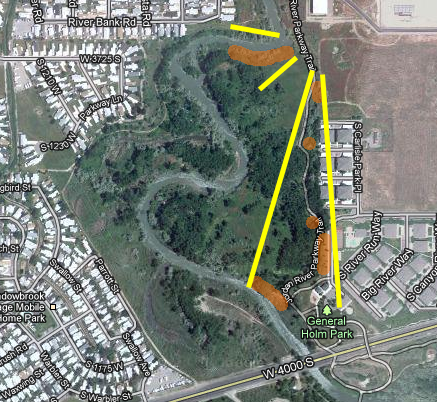 These funnel areas shown above are dense with trees and brush, but not unlike the areas in the river bends to the west. Those groves of trees in the river bends hardly ever have any birds. That twenty foot high ridge seems to be the main factor creating the bird funnel. My Lunch-hour birding patch - south of 4000 S.
In the southern portion of my lunch-hour birding patch, the river and the golf course combine to create a spectacular bird funnel. I may not see a single bird in the rest of this area, but right at the funnel point I hit the jackpot every time. So, dear readers, taking a look at your own micro-hotspots within your local patch, does the bird funnel theory hold true? I attended President Jeff Gordon's presentation on "What's new with the ABA?" at the Midwest Birding Symposium. He handed out ABA pass-along cards, which were discussed on the ABA Blog and ABA Facebook page. 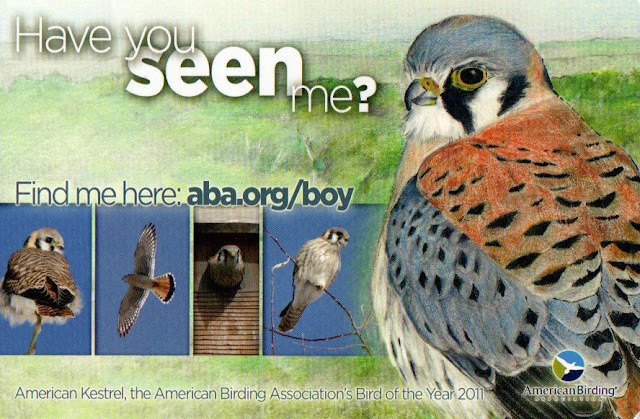 For the rest of the symposium, I carried my ABA cards in my name badge holder, which perfectly exposed the awesome Louise Zemaitis rendering of the ABA Bird-of-the-Year, the American Kestrel. 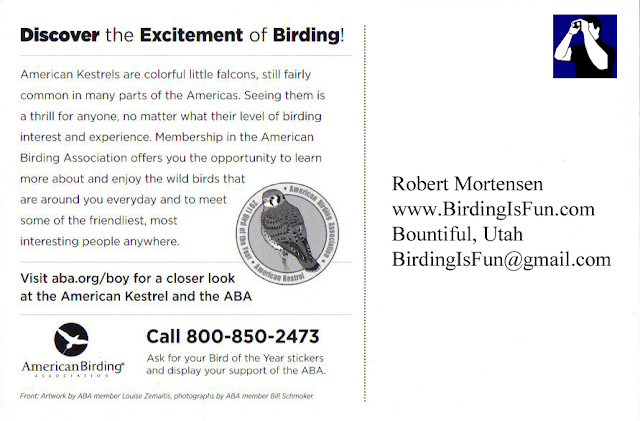 Several other birders asked me what that card was, so I gave them one...a little invitation to learn more about the ABA and to consider joining. This was very effective ABA marketing in the bird festival setting. Perhaps Jeff's presentation was intended only to give us a sneak-peek of these pass-along cards...I'm not sure though. I thought I'd see something about these awesome cards on the ABA website or in a publication by now, or somewhere else on the web. But I haven't yet...so sorry if by my sharing these here I am stealing any ABA thunder. President Gordon also mentioned that if you were serious about being an ABA advocate-recruiter-missionary-ambassador-promoter, then you could email the ABA and request some cards printed with your information in the customize-able section on the back of the card. Below is a mock-up I made for myself. I don't know that the ABA would have the budget to print color logos and whatnot, but wouldn't this be a nice card to share with other birders and non-birders alike. What a great way to share the message of the ABA, invite folks to become new members, and provide a communication link between you and the people you meet while birding. Bryant Olsen, along with Norm and Gail Jenson, while on a Great Salt Lake Audubon Society trip today discovered a Harlequin Duck along the Antelope Island Causeway. This will be the 13th record as noted on the Utah Bird Records Committee's website and likely only the 7th officially accepted and documented. The Antelope Island Causeway has also been the site of three previous records, though only one has been accepted. 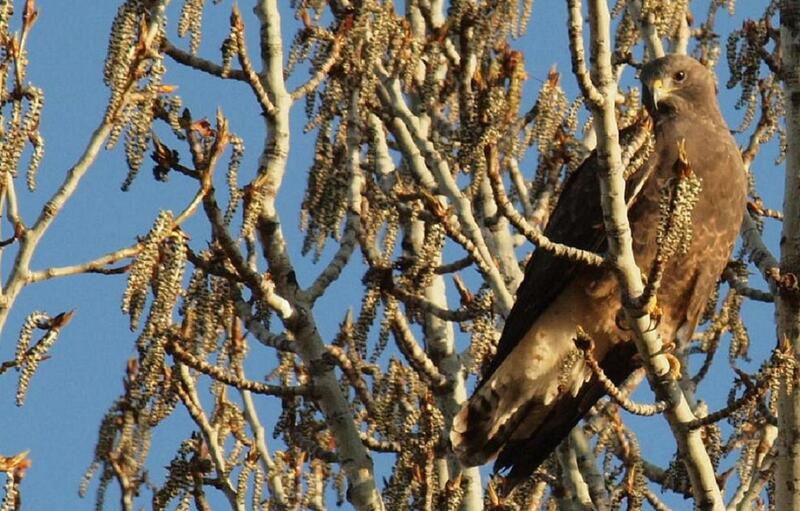 Another great bird sighting in Utah! Great job Bryant, Norm, and Gail. By the way, Paul Higgins, a great Utah bird photographer that I've featured on this site was there at the bridge when I arrived. He had discovered the Harlequin Duck on his own without knowing it had been reported. He has some incredible close-up photos here. Yes, I am a bit of a parasite twitching other people's great birds. Maybe one day I will find a Utah rarity myself. Just before the Midwest Birding Symposium, I had come across an advertisement for the new Eagle Optics Ranger ED's. Knowing that Ben Lizdas of Eagle Optics would be at the symposium manning their booth, I figured I drop by and test out these new generation Rangers. Friday afternoon, I got to meet Ben and try 'em out. These Rangers with ED glass are really cool binoculars. They are a great quality step up from what I've been used to. This step up in quality is a great value for the small step up in price. They are a bit heavier than the SRT's and I found that turning the focus wheel took me just a tiny bit longer than I was accustomed to, but barely worth mentioning here. I tried to work out a trade-in and upgrade deal and maybe a little internet marketing deal, but they don't have a program for that. Darn! Saturday morning at the Midwest Birding Symposium found me at Meadowbrook Marsh with a group of eager birdwatchers. Clay Taylor and Bruce Webb of Swarovski Optik were also there and passed out demo binoculars to any in the group interested in trying them out. I opted to test out two pairs, EL 8.5x42 Swarovison and the CL Companion 8x30, while at the same time I had my Eagle Optics Ranger SRT 8x42's harnessed to my chest for comparison. We started scanning the open marsh and pond in the twilight; perfect conditions to put these binoculars through their paces. A Black-crowned Night Heron was seen perched on a snag across the pond. I took the opportunity to glass the heron alternating between all three binoculars. A Swamp Sparrow and a Marsh Wren flitted in the reeds nearby. Again I switched back and forth between binoculars. As the sun rose higher and the light conditions improved, we enjoyed a Caspian Tern repeatedly diving and eating fish. I think I saw the tern catch three fish, each time viewed through a different pair of binoculars. Wood Ducks and graceful Great Egrets flew over the pond giving us great looks. The CL Companion 8x30's were exceptional optics. They surpassed the image quality of my trusty and beloved Eagle Optics Ranger SRT 8x42's in spite of the Ranger's larger objective lens and light gathering potential. To be honest, I was really bummed out by this observation. I have been a huge advocate for this particular binocular from Eagle Optics and had proclaimed them to be almost as good as Swarovski and for much less money. Eagle Optics Ranger SRT's are still dang good binoculars for the budget price a guy like me can afford, but after a side-by-side comparison with Swarovski in the field, I can no longer make the claim that they are almost as good. Swarovski optics are simply better...much better even! So if you are ready to make the jump from the $300 optics, the relatively affordable Swarovski CL Companion may be right for you and is now available for purchase thru Eagle Optics for $929. By the time we had finished birdwatching from the Meadowbrook Marsh deck, and determined that it was light enough to find us some warblers in the woods, I had decided that I absolutely loved the EL 42 Swarovision and handed back the CL Companion. The EL 42's with the larger objective lens and higher quality parts were all the more superior to the CL Companion, especially in the low-light conditions. 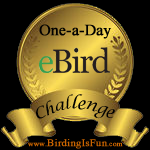 I pretty much used the EL 42's the rest of the day and racked up seven life birds using them. Wave after wave of autumn warbler came into the little corner of the woods and I was grinning from ear to ear enjoying everyone of them through the crisp image coming through this amazing glass. Now the EL 42's run $2,349 at Eagle Optics, but they are worth saving up for. Although it pains me to say this, I think these high-end binoculars actually helped me enjoying birding more and even helped me to be a better birder. I can say this honestly because it happened before when I first upgraded from $50 optics to my beloved Ranger SRT's. Now I've been spoiled and exposed to a bird viewing pleasure beyond my current means. While I save up my pennies for high-end optics like Swarovision, I'll just keep on enjoying my Ranger SRT's. I was reading the most recent issue of Bird Watcher's Digest and saw the Princeton University Press advertisement (I do enjoy reading all the ads in all my birding magazines...strange I know 'cause I never read ads anywhere else). I was surprised to see my own name on the page. Turns out they extracted a quote from my review of Avian Architecture. Kinda cool to see your name in print unexpectedly. 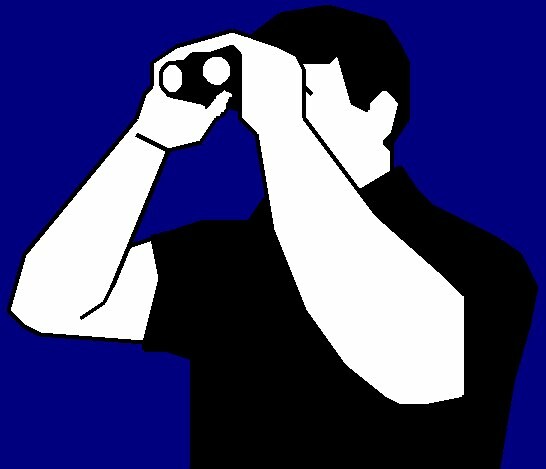 BirdWatching, the magazine, has a blog called Field of View. Every Friday they post thematic photos submitted online by readers. The recently featured silhouetted birds and while I was scanning them, I saw one photo that looked a lot like one photo I had taken. Turns out it was one of my photos! ...a Gray Catbird I had photographed singing early one morning in Garden Valley, Idaho. 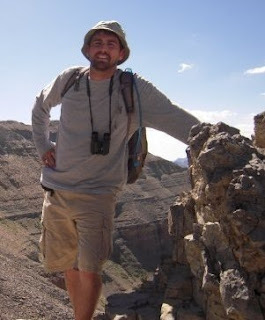 Thanks to Bill Thompson III's visit to the Great Salt Lake Bird Festival last May and his personal endorsement of my blogging efforts, and a second endorsement from Bill Fenimore, I am now participating with the extremely dedicated and wonderful planning committee for the 2012 Great Salt Lake Bird Festival. I'm honored that they'd be interested in my ideas and I hope to be a good contributor. You can count on me posting about the activities I may have a part in! 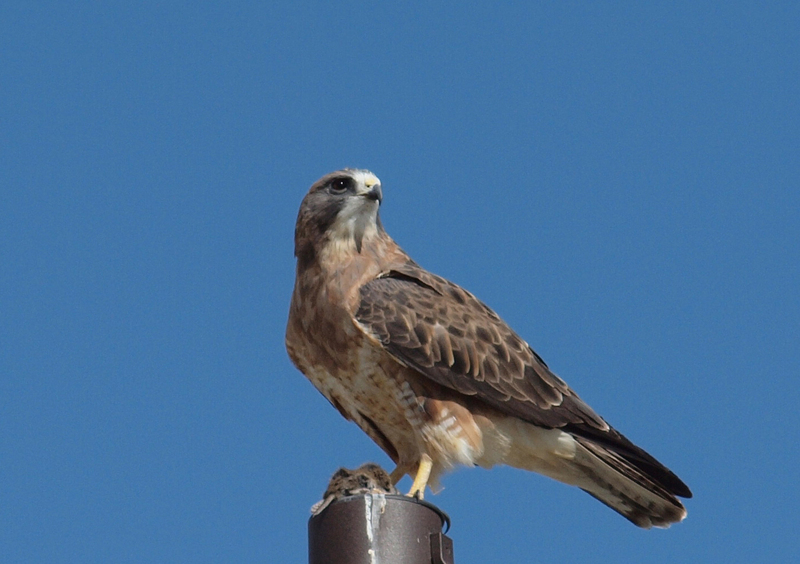 Time for all you birders outside of Utah to start planning for your trip to Salt Lake in mid-May!!! Think of the life birds you could add! On the main page of CrossleyBooks.com also quotes a line from my review of The Crossley ID Guide. If you didn't know me any better, you might think my opinion was worth a grain of salt. I think its pretty dang cool that even though I'm not an expert birder - just a guy with a lot of passion and enthusiasm for birds, birding and bird blogging - that others within our small eccentric world might care what I have to say about stuff. There are some other adventures in the works, especially a big one related to this blog, so stay tuned! The day I left for the Midwest Birding Symposium I had posted this bird photo contest. I've only had one brave soul attempt it, and he got six of them correct. I attribute the lack of enthusiastic participation to the post being buried in the deluge of posts about the Midwest Birding Symposium. So I'm going to re-post it, but this time with a few more hints (just in case the lack of participation was due to the difficulty and time it might require to complete.) The first person to identify all the species correctly can have their choice of either The Atlas of Birds or The Birds of New Jersey. Enjoy! You can click on the photos to enlarge them for more detail. 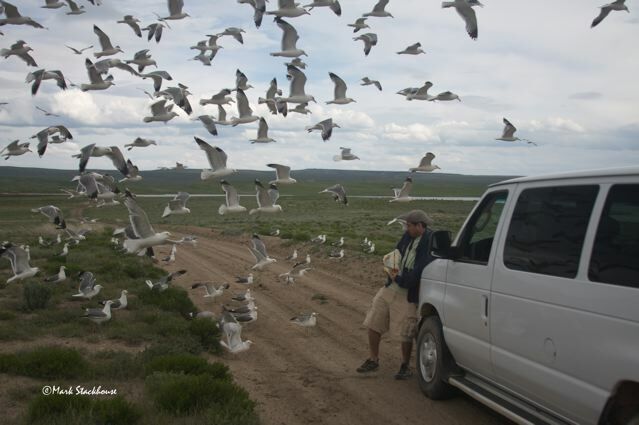 Reviewing past blog posts may also give you clues to some of the birds. Each photo should have enough clues for you to make a positive identification. 1. Hint: Photographed in Farmington, Utah. The background is the roof of an LDS Church building. Photo taken when I saw the vagrant Dickcissel. 2. Hint: Photographed in Mill Creek Canyon, Salt Lake City, Utah - Two of these birds are featured in this photo i.d. contest. 9. Hint: Photo taken in Mill Creek Canyon, Utah in a Scrub-Oak tree. Two of these birds are featured in this photo i.d. contest. Both photos were taken of the same bird actually within minutes of each other. 10. Hint: Photo taken at my lunch-hour patch. I'm gonna leave this one as a challenge for ya. Are you ready to take the challenge! Click on the gold medallion for details. I've been fortunate enough to see and hear about ten of these little fellas in my few years of birding experience. I've seen them in Arizona, Idaho, and Utah. These are a pretty tiny birds, similar in size to a Ruby-crowned Kinglet, and flit about the mid-sized bushes near water stirring up bugs to eat with flicks of their tail. They are very responsive to pishing and will make a close approach to investigate. While reading up on this cute little gnatcatcher, I noticed that most all the drawings and photos showed a dark bill, not the yellowish bill with dark tip as seen in my photos. The Stokes Field Guide and Crossley do show the winter plumage bird and it does have that lighter colored bill. It looks pretty gray most of the year, but I did once see this bird with a blue hue at the Juniper Rest Area right near the Idaho-Utah border. 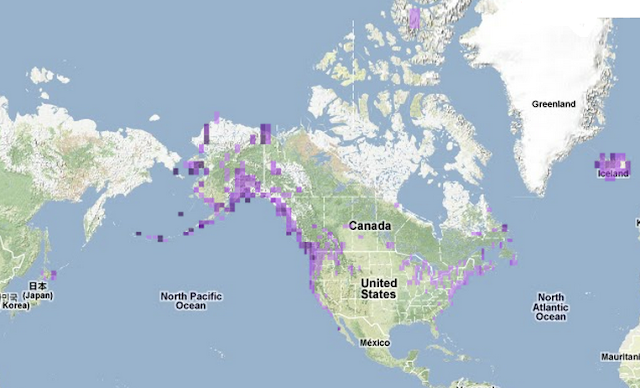 Animated map of eBird sightings showing annual migration pattern.